The placement of the medieval manor house was well chosen, as this was a defendible site on top of a high vantage point, with the River Irwell beneath. Standing close by the middle of Medieval Bury it was near to the central key features of the market place, the large market cross and the parish church. Other industries were located nearby- Butcher Lane (off the Rock) was the site of iron smelting. Medieval Bury had a market day every Friday (granted by royal charter) and fairs in April and September. To build Bury Castle, the moat from the preceding smaller manor house was remodeled- its original sloping sides were made vertical and lined with sandstone blocks. These were further strengthened by the addition of buttresses and this substantial masonry work can be seen today on visiting the site (see picture on the right). The newly constructed tower house would have been two or three stories tall. We know that its walls were made from very thick sandstone blocks, some 2.3 metres wide. The floor dimensions were 25 by 19 metres, making it one of the largest houses in England at the time (see artist’s impression below). This form of fortified house doesn’t occur much south of Lancashire, and is more associated with the troubled border regions between England and Scotland. Clearly conflict with Border Reivers or the Scots could occur this far south on occasion. The lower floor would have been used for storage and probably also had a kitchen. Narrow windows would have given a little light, but lots of security. The upper floors would have contained the great hall. This would have served as a place to receive and entertain visitors, as well as being a dining room for the Pilkingtons. Private accommodation for the family would also be on the upper story. On August 22nd 1485, Thomas Pilkington fought in the last battle of the War of the Roses, at Bosworth Field. He had been summoned to the side of King Richard III against Henry Tudor. Another Thomas, Lord Stanley and his brother Sir William Stanley held their own troops back during the battle, seeing which side would have the upper hand. At a crucial point William Stanley committed for Henry Tudor, and his men were part of the direct attack on King Richard. Richard was killed and Henry Tudor became King, founding the long lasting Tudor dynasty. 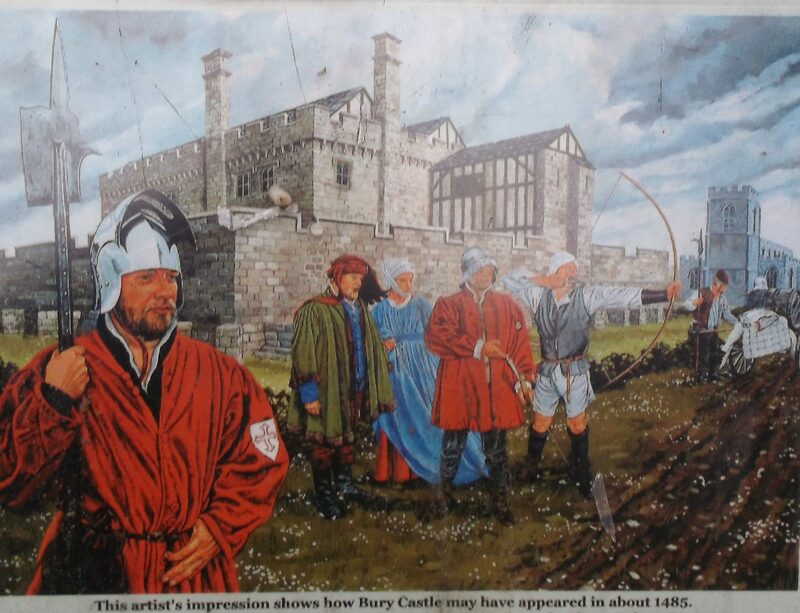 Thomas Pilkington survived the battle, but his support for Richard led Henry Tudor to strip him of his lands, and to give the order for Bury Castle to be ‘razed to the ground’. Henry Tudor, now on the throne as King Henry VII, rewarded the Stanleys and gave Thomas Lord Stanley the Pilkington family estates and made him the Earl of Derby. The newly created Earl rebuilt his ancestral home at Lathom near Ormskirk and was granted a licence to fortify his manor house Greenhalgh Castle, near Garstang. He did not however, do similar with Bury Castle. Whether it was deliberately slighted as the king had ordered, or just allowed to decay is not clear. Fifty years later a visiting historian, John Leland, described the castle as a ruin. The stone for the walls of the tower house and moat wall would have been of high quality and so would be robbed away to be reused in other buildings. The moat would have soon silted up and archaeological finds show that it was used as a rubbish dump. In 1865 workmen were digging in the castle croft area of Bury to lay a new sewer. Their trenches revealed the buried walls of the castle. Charles Hardwick, a local Victorian historian, drew a plan which gives us the dimensions of Bury Castle and its moat wall. The Castle Armoury was built over the remains three years later for the 8th Lancashire Rifle Volunteers, and its siting and crenellations are clearly in tribute to the original castle. In 1973 to 1977 Bury Archaelogical Group excavated part of the site, and a second excavation took place in 1999. Finds from the digs are currently on display in Bury Museum (as of March 2015 in the display panel on the basement floor, opposite the lift). The artefacts give us a window into the late medieval and Tudor period. Discoveries include a medieval stone ball missile (a Petard ball), which would have been fired from a small cannon-like gun. This dates from the time when the castle was occupied by the Pilkington family. Other finds include: shards of Medieval glass- some from stained glass windows, others from wine bottles and drinking vessels; pottery fragments from mugs and tankards, some of which still shows the decorative colourful glaze; rare items such as a wooden carder (to break up wool fibres) give evidence of Bury’s wool industry; and a leather arrow spacer for the top of a quiver- presumably to keep the archer’s arrows apart. Shoes from the 1600s were found in the moat, the wet clay preserving the leather that would have normally perished. These were either thrown in the moat as rubbish, or may have come from a nearby cobblers workshop. To see a couple of examples of the actual shoes on the Greater Manchester Museum Group website click here. Today on view at the site is part of the moat and and the southern defensive moat wall. Sandstone blocks make up the face of the wall, and nine of the original buttresses are added to strengthen it. A modern grass ditch has been put in place to give an idea of the depth of the moat. The original moat of Bury Castle would have been wider than the one we see today, about 14 metres wide on the south side (the side that is exposed), and 10 metres on the other sides. 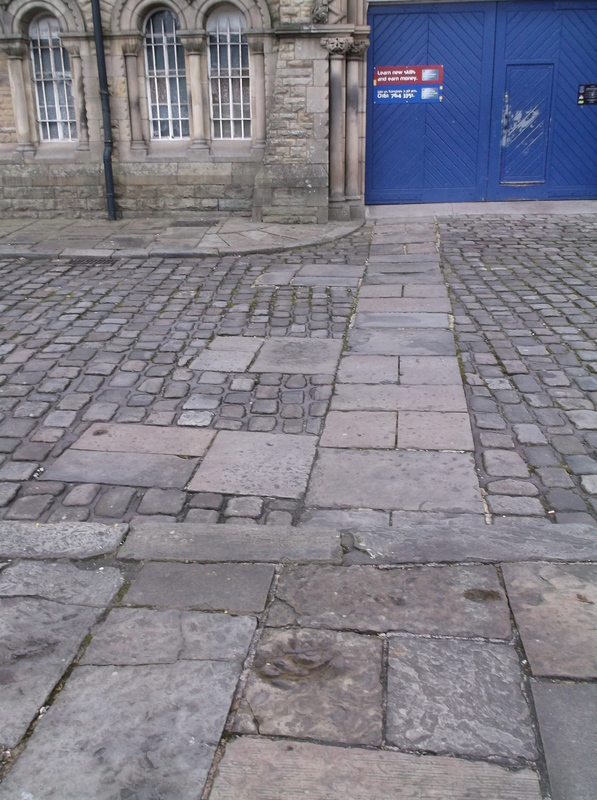 Part of the plan of the castle is laid out in the cobbles in front of the armoury. There are a total of four parallel lines of paving, showing the two outer moat walls and the two inner walls of the tower house. Of the two types of lines, the moat walls appear thinner and have their buttresses connected to them, giving them a jagged, blocky appearance. To see the trace of the western moat wall, stand with your back to the corner of the exposed south wall of the moat (where it turns 45 degrees) and look towards the blue doors of the armoury. You can see the flat paving slabs marking the moat wall running towards the armoury entrance. Three buttresses are also marked, sticking out to the left of moat wall into the cobbles (see the picture on the left, and click on it to enlarge). Now walk down the street, towards the Two Tubs pub. 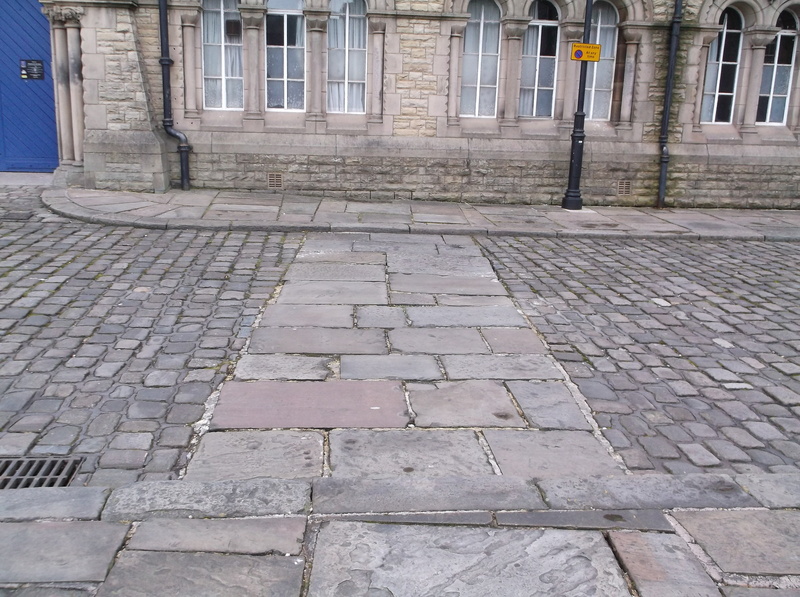 You can see two more parallel lines of flat paving in the cobbles – these form the outline of two of the walls of the tower house. They are wider than the moat walls (and don’t have any buttreses marked on). The picture to the right shows one of them. 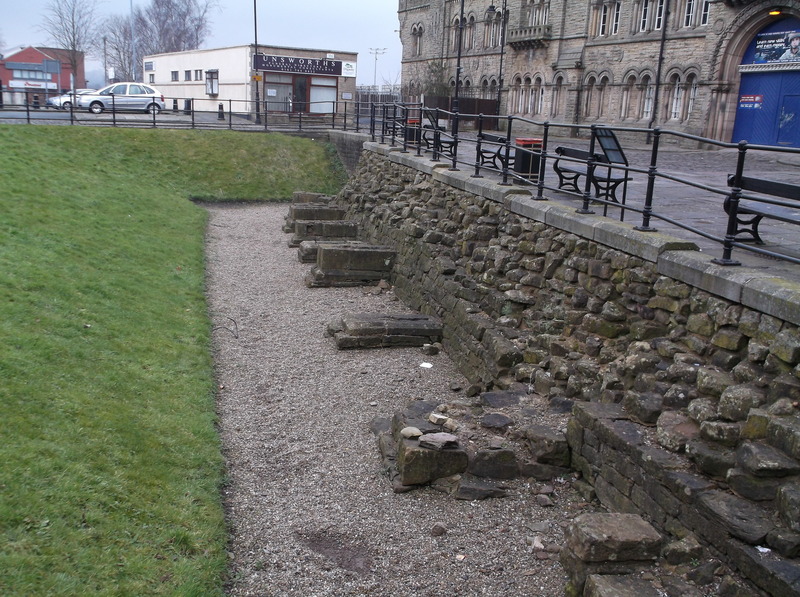 If you continue down the street a final section of the east moat wall and buttresses can be traced. The site of the Bury Castle is open access and can be viewed at any time of day. Bury Museum and Art Gallery is open 10am- 5pm Tuesday, Wednesday, Thursday, Friday and Saturday. Admission is free. The museum changes its displays fairly regularly, and is always worth a visit. Bury has ample town centre parking. Just head up towards Bury Parish Church and go down the street facing its entrance (with the Two Tubs on your right) . The remains of Bury Castle are opposite the armoury building.